We have, as Dog Lovers , have experienced an unusual situation whenever we take our Dog for a Walk outside. This Unusual Situation is Your Dog Starts Biting the Leash . This is a Very Common Problem. We all have Faced it , isn’t it? Especially when your Dog is too young or a Puppy and he is not that familiar with going for a walk outside. 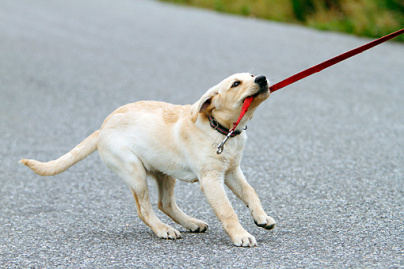 Your Dog or Pup is not used to having a Leash controlling his movement as he is used to walking freely at home. We, Humans also face difficulty in learning something new and the things which we are not used to do. Similarly, Dogs also don’t know how to React to this Leash on their neck. So , We would share Some Latest ways which help you Solving the Problem of Your Dog Biting the Leash when going for a walk outdoors. But First, Why do Dogs Bite the Leash? What can you Do to Stop Dog Leash Biting? How can you Perform these Steps to overcome Leash Biting? What to Do if Doggy Bites the Leash During Indoor Training? Here’s a Situation , You Take your Beloved Dog for a walk and instead of him or her keeping her feet on the Ground , She starts bouncing and Playing Tug with the Leash. You Start Shouting “No…! No Dog ..Stop It…!…What are You Doing….Don’t Do….” but it doesn’t seem to work. If your Dog is Acting Like this above , she Loves holding things in her mouth and playing tug with you . It is Mainly your Reaction to her activities that gives her more encouragement as well. Secondly ,Dogs Love to Catch anything that is Moving. They Bark on Moving Cars, they run after moving ball, they chase you when you are running…and the list goes on…. and Hence , they also Hold and Bite Leash as it is also a Moving Object and it Excites them . Another Reason can be , Like i Said, Your Dog is not Used to having a Leash on his neck and he may be Feeling Uncomfortable . They were Bored inside House and they want to run and enjoy themselves out in the Middle , but they are held back by this annoying Leash and they want to get rid of it somehow. These can be The Reasons why your Dog is Biting the Leash and now lets talk about the ways by which can Stop him from repeating this. We can Try to Stop an Unwanted Behavior of our Dog by Replacing it with another Behavior. As you Train the New Behavior , the old “bad” behavior stops . We want our Dog to Stop Bouncing for the Leash and shifts his Focus on Surroundings. So, we can Point our Finger to something outdoors that he may be Interested in rather than his Leash. After All , there are much better things to Focus Outdoors rather than Leash. You must be Wondering when did you Appreciate his Biting the Leash Behavior? Let’s Create the Situation where your Dog Starts Biting the Leash. You will Push the Leash away from his Mouth and Dog Tugs with it and Tries hard to get it back in his mouth. You Shout ” Stop it “….Calling your Dog’s Name and finally he stops. Did you Wonder whats going on Here? Let me Tell you. Some Steps that your Dog moves without Biting the Leash shall be Rewarded by you. You should Love her and call her “Good Girl” or “Boy” and again start walking further. Treats can work here as well. I know this seems very Frustrating as you would need to Bend and stop repeatedly but you won’t need to do every time you go for a walk. Doing this for a week would be enough. Remember, By Biting the Leash and Playing tug, your dog wants to play and enjoy. By Rewarding him and Giving Treats, you are telling him that he would get to play if he doesn’t Repeat this. The Problem here is not that your Pup is Playing Tug , Problem is that he is that Playing Tug with the object he is not supposed to. Your Dog Likes to play Tug then let’s make him play it. But, not with the Leash , He will Play Tug with the Tug Toy. Yes, Get your Dog a Good Tug Toy , like a Knotted Rope Tug Toy which he can Pull and Enjoy. You can also get an Attractive Loofa Dog . As you can Observe in the Pic above ,The Longer the Toy , the Better it is as you won’t need to Bend down. Now , You need to Teach the Pup that he can Go Nuts over that toy. Pull the Tug Toy Tightly and Drag it on the Ground . Play Tug of War with your Dog with this Leash. This way, You are Teaching him that he can have a Blast with this Tug Toy . Shout “Get It” and every time your Dog Grabs the Toy , Praise her or him. This is a very Important Step. You need to Teach him and Train him with the Leash before you step outside. As you have Already Played with the Tug Toy Before a couple of times , then start doing this Step. 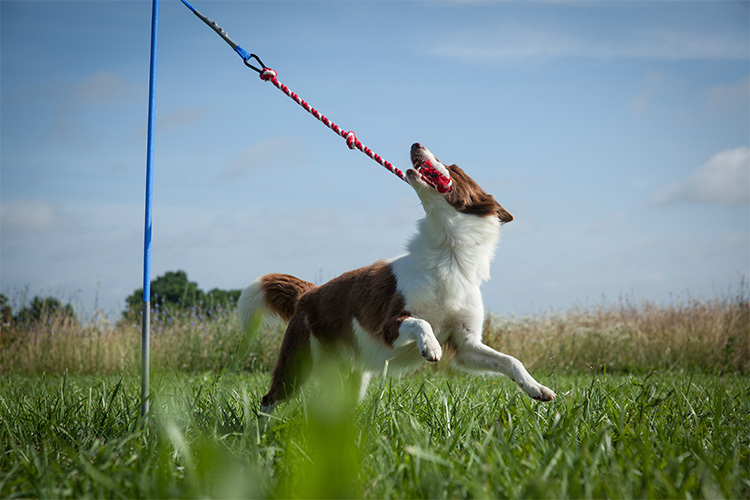 Now that your dog has an Idea that he needs to play tug with the Tug Toy and he can Bite and Pull that toy without any Hesitation, Start Training your Dog with the Leash Behavior inside your House. Area of Training can be Living Room, Backyard, or any place you think is Suitable. You are Teaching your Dog a new trick and he needs a calm environment to Focus before he move on to Outdoors where there are many Distractions. Now, You would need Some Treats as well to reward your Dog’s Good Leash Behavior . Attach the Leash to your Dog in a Boring Fashion . Be slow. Don’t Show her that you are going to attack her or something. If , your Dog Grabs the Leash, Just drop it . Try again till you attach the Leash Successfully. As Long as your pup doesn’t grab or bite the Leash, Praise him and give him Treats. You will do Opposite of what you used to do Before, that is , Not Praising your dog’s good leash behavior and not paying attention to your Dog. Do This for a couple of Minutes and then get that Tug Toy again and play with him. You can have a Look at This Video and Observe how this Lady Trains her Doggy. 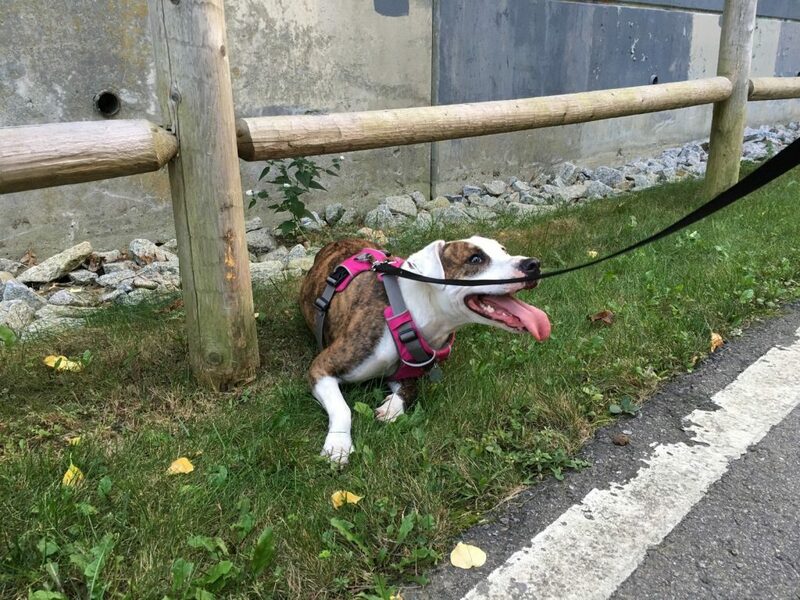 You have to do just that you were doing the first time outdoors when you were on a walk with your Dog and she didn’t used to Bite Leash. You have to Stay Still and be Boring when your Dog Bites the Leash. Drop the Leash Immediately, Don’t shout and play tug with him. When he Drops the Leash when he observes you are not anymore interested, Offer her Treats and Praise her. You Noticed what’s going on here? Your Dog is Learning that He will be Praised and get Treats if he Drops the Leash but will not get anything to play with if he Grabs it. Also, He gets to Play and have a Blast with that Tug toy and you will Accompany him and Play along with him on the Tug Toy but won’t do the Same with the leash. Not Biting the Leash makes good things happen but Biting the Leash makes Good Things Stop. Slowly and Gradually , Your Dog will Stop Biting the Leash. When you are Sure of your Doggie’s Good Leash behavior and Confident of him and yourself. Just take him Outdoors for the Walk . Your Dog may run here and there and starts smelling everything. This is Great as he is more Interested in Things and Objects around him rather than the Leash . If your Dog Bites the Leash, Just Drop the Leash and Hold Him from the Collar and be Boring and stay still. You can have a Look at these Obedience Training Courses for your Cute Little Doggy.